The Royal Ballet was in town after a decade's absence, presented by the Joyce Theater Foundation at the Koch Theater. The first program comprised The Dream, by Frederick Ashton, which is familiar to ABT audiences, who might also have felt a fleeting inferiority complex as Natalia Osipova danced Titania, as she also dances with ABT, but missed the last couple of weeks due to an injury. She fell here, eliciting gasps from what seemed like the entire Koch house, but seemed alright subsequently in this role that places fewer high technical demands on a ballerina than many of the classics. In any case, her impish charm and ethereal bearing supported the supernatural aspects of Titania. Matthew Golding danced Oberon with a compatible lightness (although he seemed confined by the stage), and Valentino Zucchetti the role of Puck, bounding into split jumps and lending the character some witty humor. Song of the Earth, by Kenneth MacMillan, balanced out the program. This multi-part suite to Mahler, sung live onstage by Katharine Goeldner and Thomas Randle, utilizes a highly formal, inventive vocabulary that ranges from geometric to emotionally expressive. The simple costumes and lack of set elements (apart from some masks) and obvious storyline shifts the ballet's entire impetus to the dancers, movement, and music. Edward Watson (eloquent, if slightly early in his timing) danced the Messenger of Death, with Laura Morera (who moved with muscularity and great intention) and Nehemiah Kish in prominent roles as well. The exactitude of the steps and positions requires the dancers to rein in excess emotion; every carved step is meaningful. The second program offered a view of the variety in the Royal's repertory. Wayne McGregor's Infra is marked by a graphic set by artist Julian Opie, a horizontal video board with simplified images of people walking, hovering above the stage. The dancers below, in tops and trunks, mirrored the walkers at moments, and in between, wielded their bare gams in McGregor's brand of exaggerated balletic lines emanating from the pelvis, forced pointe shoe arches, and split developpés. The general chilliness of McGregor's aesthetic is humanized by the physical interaction and kineticism on display. An act of Divertissements followed, mixing in ebullient classical (Ashton's Voices of Spring) with its deceptively breezy looking one-armed lifts and skimming assisted grand jetés. Contrasting male solos followed—Borrowed Light (Alastair Marriott), an expressionistic romantic morsel; Le Beau Gosse, (Bronislava Nijinska), a humorous number featuring athletic poses and references; and The Dying Swan (Calvin Richardson), a robotic male interpretation of everyone's favorite ballet cliché. Wheeldon's duet, Aeternum, showcased Claire Calvert's enviable high insteps and arches, and Carousel Pas de Deux featured the charming tomboy antics of Lauren Cuthbertson and the suave, leggy Golding, looking a bit Chippendale, shirtless in a vest and scarf. 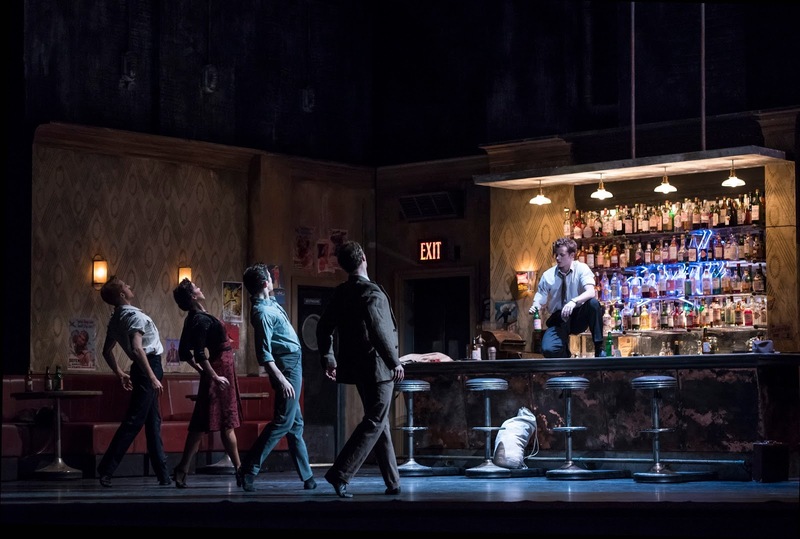 Most fascinating was Liam Scarlett's The Age of Anxiety, evoking shades of Jerome Robbins Fancy Free with its musical theater underpinnings, a Leonard Bernstein score from which the dance derived its title, and a first-scene bar setting. 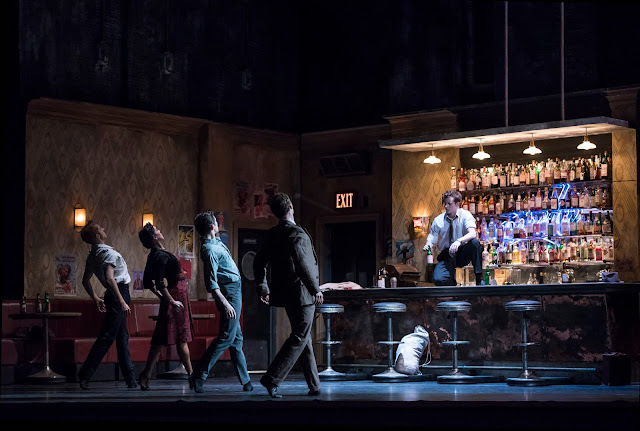 Seemingly taking place post-war, one woman and three men drink separately in a well-worn bar, eventually gathering and moving on to a swanky modern apartment, most likely the woman's (Sarah Lamb). They mix and mingle, taking turns pairing off with the woman, and the men with each other. The finale features one of the men, apparently elated by the imminent freedoms on the horizon, rejoicing in the city's golden dawn. With the city's upbeat mood from the Supreme Court's ruling for marriage equality still prevalent, it's hard not to think of Age as somehow prescient. The second program was gratifying as it showed unfamiliar repertory. The choice to present The Dream is somewhat mystifying; even though it is well-liked here, and is a sensible balance, both aesthetically and length-wise to Song, it is maddeningly familiar. I also wish I could have a better acquaintance with the company's wonderful dancers (who aren't shared with ABT). May they visit sooner next time. Program alert: This fall through spring, the Royal Ballet will be featured in ROH Live Cinema broadcasts and will include classics (Giselle, R&J, repertory) as well as premieres of Scarlett's Frankenstein and a production of Carmen by Carlos Acosta.